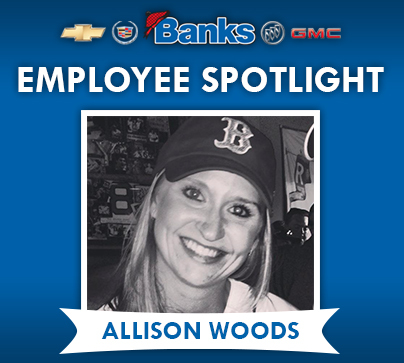 Allison Woods just celebrated her 2 year anniversary here with Banks Chevrolet. Prior to joining Banks, Allison was managing an irrigation company in Henniker, NH and decided to make a career change into the automotive industry. Allison is a senior customer care representative here at Banks and we are incredibly lucky to have her. How did you get the job here? The irrigation company I was working for was doing work for Banks. When I decided I wanted to make a career change, my boss at Blue Sky Irrigation called Bill Jasak (General Manager of Banks Chevrolet) and apparently gave me a great recommendation. So here I am! 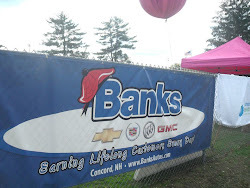 What is your favorite memory of Banks Chevrolet? When I first started working here, training with Tim Sattler and learning about all the different vehicles. I really liked driving them all. That’s tied with August 2012 when Banks paid for all of the people in Customer Care to have dinner at O’s. They took care of everything. They were showing their appreciation for us by sending us out on an all expenses paid night on the town. Limo and everything. What do you like most about your job? I like how fast paced it is and just that our department is so laid-back. It’s an easy place to work. Favorite thing to do in NH? Skydiving. I’m a thrill seeker. I like roller coasters, zip lining, whitewater rafting… that type of stuff. I really like Alpine Adventures in North Lincoln NH… it is a great location for a day trip and has really beautiful scenery when you’re 500 feet above the treetops! What are your hobbies? Kayaking, and I do a lot of cooking and baking. Someday I want to be on cupcake wars. And I’m kind of obsessed with my dog (although technically, it’s my roommate’s dog). I also like 3D movies like the Great Gatsby and Avatar. And of course, Boston Sports. Favorite meal? Macaroni and cheese is my favorite meal to eat, and my favorite meal to cook is salmon. Favorite childhood memory? Probably when I went to Disney World for Christmas when I was 9. The Christmas Day Parade was awesome.